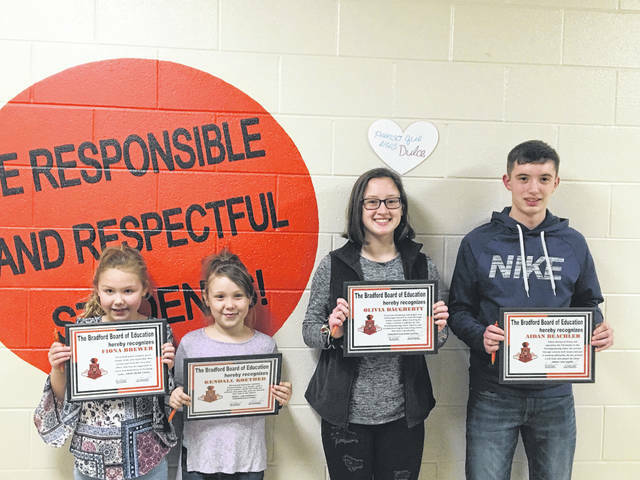 Sam Wildow | Miami Valley Today The Bradford Board of Education honored four students during their student spotlight on Monday evening: left to right, Fiona Brewer, Kendall Koether, Olivia Daugherty, and Aidan Beachler. BRADFORD — The Bradford Board of Education voted to keep their athletic affiliation with a group of schools discussing plans to exit the Cross County Conference during their meeting on Monday evening. Hurst added that Bradford was the first school board in the group of schools with plans to leave the CCC to adopt a motion like this. The board voted 4-0 to keep Bradford’s “athletic affiliation with Ansonia, Arcanum, Franklin-Monroe, National Trail, Newton, Mississinawa (Valley), Tri-County North, Tri-Village, (and) Twin Valley South … to form a new athletic conference separate from the current Cross County Conference no later than June 30, 2021.” Board member Louis Reindel was absent. Those schools verbally announced their plans to leave the CCC during an emergency conference meeting in January, according to previous reports. Newton and Bradford are the only two of the 10 schools located in Miami County; the rest are in Darke and Preble counties. This vote comes one month after the board voted to continue their football program’s involvement in the CCC following the recommendation of the football committee. Also during their meeting, the board honored four students during their student spotlight. Junior high and high school science teacher Ryan Schulze recognized two students from his pre-engineering class, Olivia Daugherty and Aidan Beachler. Schulze then commended Beachler for fixing and operating a 3-D printer in a former computer lab in the school. “He worked with it basically the last month, figured out how to set it up, how to troubleshoot it, how to fix it,” Schulze said. “He’s actually had to fix parts and glue it together. He’s enjoyed doing that.” Schulze said that Beachler successfully printed a train and plaque on the 3-D printer. Secondary Principal Matt Triplett then recognized Schulze during the staff spotlight, saying that Schulze is a favorite teacher among students. “Mr. Schulze works hard in establishing meaningful relationships with all students and staff in and out of the classroom setting. He and his students work hard every day to make new advancements in our pre-engineering course,” Triplett said. Later during their meeting, the board approved the calendar for the 2019-20 school year and the course of study for 2019-20. Hurst said that 72 percent of their teachers also approved of the school calendar. The board also accepted a donation from the Bradford Band Boosters for the music department in the amount of approximately $1,720 to go toward the purchase of two French horns. https://www.dailycall.com/wp-content/uploads/sites/30/2019/02/web1_Bradford-Board-student-spotlight-021119-CMYK-1.jpgSam Wildow | Miami Valley Today The Bradford Board of Education honored four students during their student spotlight on Monday evening: left to right, Fiona Brewer, Kendall Koether, Olivia Daugherty, and Aidan Beachler. David Fong contributed to this story. Reach Sam Wildow at swildow@aimmediamidwest.com.